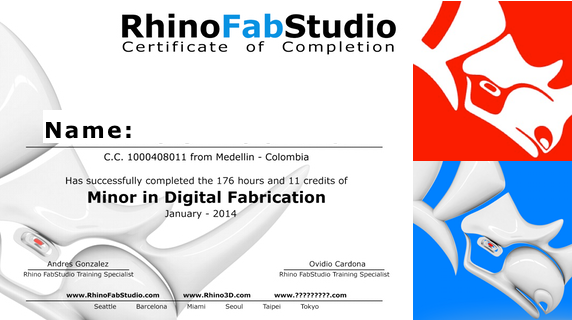 The RhinoFabStudio Digital Fabrication Minor is intended for designers, architects, artists, engineers, and other professionals of associated fields. The Digital Fabrication Program involves introductory as well as advanced courses in 3D digital modeling, generative and data-driven modeling, physical computation and interaction, as well as digital fabrication. At UPB’s RhinoFabStudio students are able to use the latest inventive technologies such as 3D printing, computer controlled CNC milling and routing, and laser cutting to produce their three-dimensional creations. Join us at the Commencement Ceremony to honor this year's students that have achieved their Digital Fabrication Diplomas. Place: Universidad Pontificia Bolivariana - UPB: Auditorio Juan Pablo II, Bloque 10 - Medellín, Colombia.